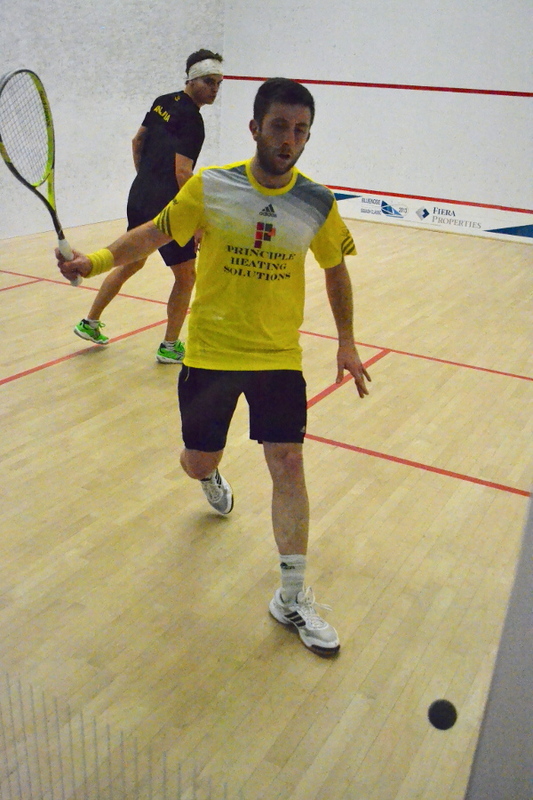 Colombian squash star Miguel Angel Rodriguez upset top seed Daryl Selby in the final of theFiera Properties Bluenose Classic to consign the Englishman to runner-up of the PSA World Tour International 35 event in Nova Scotia for the third time since 2010. Third seed Rodriguez, the world No16 from Bogota, reached the final after upsetting Alister Walker, the No2 seed from Botswana, in the semi-finals of the eighth edition of the Bluenose Classic. But after the Colombian built up a 3-0 lead in the opening game of the final, it was Selby, the world No14 from Essex, who reclaimed the initiative – taking eight consecutive points en-route to an 11-4 game one win. Rodriguez (pictured above in Bluenose action with Selby) changed his tactics in the second game, and soon drew level after conceding just two points – an achievement he duplicated in the third. 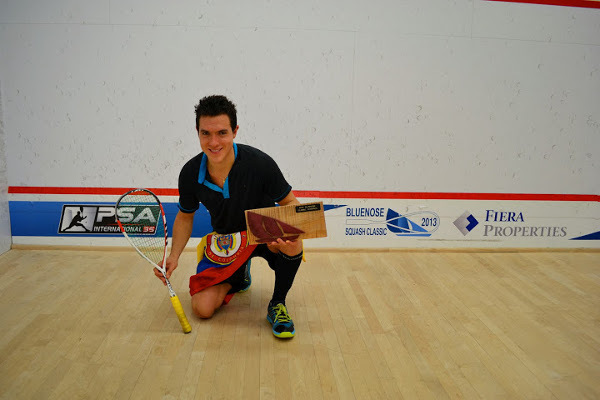 Selby fought back to 4-7, but the 27-year-old from Bogota continued his dominance to close out the match 4-11, 11-2, 11-2, 11-6 in 58 minutes to win his first Bluenose Squash Classic Championship. “I didn’t play badly today and played well in the first game,” said Selby later. 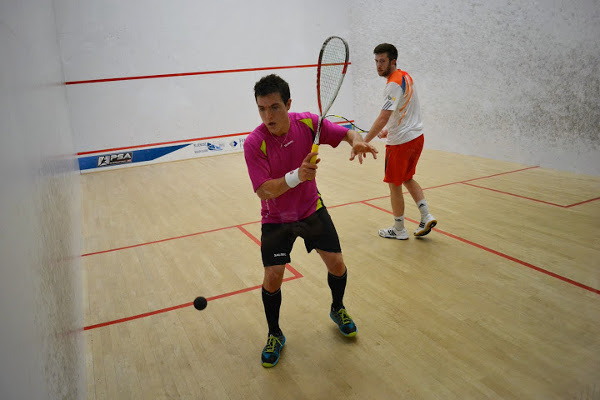 “Credit to Miguel, he played unbelievable squash after that. He upped the intensity, and did it absolutely perfectly. Rodriguez pronounced the final as “one of the best matches I’ve ever played”. “I was ready to play this match,” continued the highest-ranked South American of all-time, who now boasts 23 PSA World Tour titles from 31 final appearances. In the semi final, Rodriguez upset second seed Alister Walker – ranked just a single place higher in the world – in four games. The closeness of their rankings was evident in the opening rally between Walker and Rodriguez(both pictured above) – which lasted 107 shots and 3 minutes! The Colombian took an early 4-0 lead and went on to take the first game. “I was going too early to the front and I knew I had to change things up,” admitted Rodriguez later. Indeed, the third seed began mixing the pace of the rally, at times forcing the pace, and at others opting to build position. 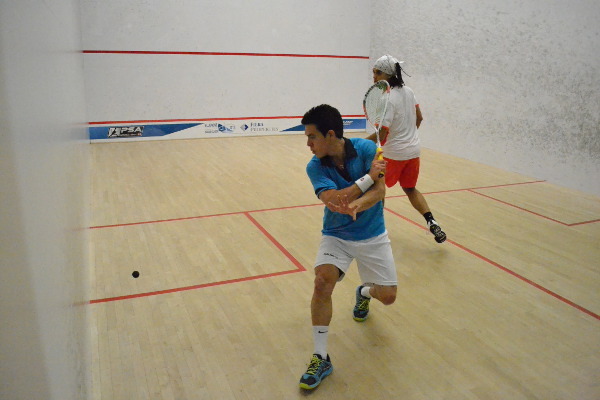 Rodriguez went on to take the match 11-3, 8-11, 11-5, 11-5 after 51 minutes. In the second semi, Dutch champion Anjema took the first two games and led 4-1 in the third as a straightforward straight games win seemed on the cards. The world No14 from Essex (pictured above with Anjema) continued to impose himself on the match before running out an 11-13, 5-11, 11-8, 11-8, 11-2 winner. Selby is celebrating the 20th PSA Tour final of his career, and the second in a row, while Rodriguez is marking his 31st. The final will be the pair’s sixth Tour meeting – but first since October 2008 – with Selby holding a 4/1 head-to-head lead.